The Bothamley family made clocks for at least four generations in and around the town of Boston in Lincolnshire. In recent times the name has been spelled by the family as Bothamley, but Bottomley seems to have been commonly used when the name was written in older records. However the only clocks I know personally by them have the name spelled Bothamley. The earliest clockmaking member was William Bothamley, who was born about 1715 and worked at Kirton in Lincolnshire - properly known as Kirton-in-Holland to distinguish from the other Lincolnshire Kirton, Kirton-in-Lindsay. William married in 1745 at Pinchbeck to Mary Parkinson, and their children included one named after Mary's maiden name, Parkinson Bothamley, born in 1751, and who was to carry on the next generation of clockmaking. It is not know where William originated nor where he learned clockmaking, but the surname is common in the locality. In February 1757 William was still residing at Kirton when he took an apprentice named John Ogle till 1764 at a premium of £12.00, which was quite high, suggesting he was not short of money and could afford to pick and choose. It is debatable whether he chose wisely, for all the only later knowledge we have of John Ogle is that he was working in Lavenham in Suffolk in June 1771 when he went bankrupt, and then claimed he was 'late of Amsterdam'. William died in April 1759 aged forty four, almost exactly two years after his move to Spalding. His death left a young family of several children, young Parkinson Bothamley being only eight years old. His will shows that he was also a farmer and left cattle and other livestock to be sold by his executors and paid out to his children at the age of twenty one. If Parkinson Bothamley spent his formative years training to be a clockmaker, which he must have done, there is no known record of it. A normal apprenticeship was chargeable for duty by the Inland Revenue based on the 'premium' charged by the master to the child's parents for clothing, housing and feeding him for the specified period, and all such records from that period are preserved to this day - but no such duty-paid apprenticeship record exists for him. Apprenticeships for youngsters put out to apprenticeship by the parish overseers of the poor, were not charged such a duty, and it is possible Parkinson fell into this category, particularly if his family were on hard times. Apprentices trained under family members usually paid no more than a token premium and no duty was payable on those either. So there are two possible reasons why we cannot trace this apprenticeship, even if it did exist. Parkinson was married in 1771 at Skirbeck, a district of Boston, to Elizabeth Wade, at which time he would have been only twenty years old - and not due to receive his inheritance till the age of twenty one. In all he fathered fifteen children, many of them dying young. In 1779 he was said to be 'of Kirton' when he took on an apprentice for the usual period of seven years named William Clarke at a premium of only £10.00. The higher the premium, the higher it is thought was the prestige of the clockmaker, who could therefore command a higher sum. This implies that Parkinson did not have the degree of respect in the trade that his father had. Or perhaps he was just less well off and needed the money and the apprentice. He was first recorded as a clockmaker in the trade directory at Boston for 1791, where he erroneously appears as Jarkinson - presumably someone could not read the unexpected name from a hand-written note, mistaking the P for a J. 1. 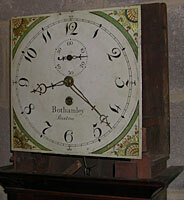 The Bothamley wall clock, which came through auction just recently. Click for closer view. In a recent book published in 2001, 'Lincolnshire Clock, Watch and Barometer Makers' by A. S. H. Wilbourn and E. Ellis, the authors reproduce an undated printed handbill setting out the conditions of a Clock/Watch Club organised by Parkinson Bothamley of Boston. The document carries no year, as that was meant to be filled in when used, but by its style it would seem to date from about 1790. A clock Club was a well-known and well-used means of drumming up trade during a quiet spell, and quite a number of clockmakers ran them, especially those in rural areas. It was a sort of early system of hire purchase and lottery combined, but nobody lost his money. The club could be run for a clock or a watch as the client wished. What happened was that those who wished to join would meet once a month, usually at some favourite tavern. Each would then pay over the prescribed monthly sum, which in all totalled the price of the clock or watch. Lots were then drawn and the lucky winner went home with his watch at the following meeting. Next month the same thing happened. The problem was that the rest of the group had to ensure that those who had already got their watches kept on paying till the last member got his! To ensure this the clockmaker forced all to sign up to the decreed terms, and 'peer pressure' did the rest. It is the terms of Parkinson Bothamley's Clock Club, which are set out on the printed handbill. In the example in the book the name of the tavern and date are left blank, suggesting that this particular handbill was one which was not used. No doubt Parkinson kept some blanks ready for his next club. The number of members was to be twenty one, each paying four shillings and three pence a month for a watch or a clock valued at four pounds four shillings (£4.20p) or four guineas in the coin of the day. The additional three pence each per week was to pay for drinks for the evening to help lubricate the proceedings. They were to meet each night of the full moon. Anyone wanting a more expensive item could top up the difference. Most of the nine conditions set out in the leaflet concern what was to happen in the case of anyone defaulting. Such a club was helpful to less affluent people who could raise four shillings a month but might never have been able to save up enough to raise four guineas in a lump sum. It also meant that the clockmaker could sell an extra twenty one clocks more than he otherwise might, thus keeping his order book in a healthy state. A busy clockmaker would have neither the time nor patience to run a Clock Club. The very fact that he is running such a system tends to point to a clockmaker in need of trade, usually at an early period in his career and not yet fully established, or else at a time of unusually slack demand. Clock Clubs were usually more popular in rural areas, catering for those with lower incomes. In 1795 an odd announcement appeared in the 'Lincoln, Rutland and Stamford Mercury', in that he 'announces that he is retiring from business and recommends ... his successor, Joseph Simkinson, who has entered upon the stock-in-trade at his old accustomed shop at the Bridge Foot'. He was forty four years old, the very age his father had been when he died. Could he really have planned to retire this young. Was he driven by the fear of an early grave, as had happened to his father? This is a strange business. Joseph Simkinson was never heard of again in the trade, either before or after. And Parkinson Bothamley seems to have carried on the clockmaking trade as before! In later years the Boston shop, then in the Market Place, claimed in large letters above the shop window 'Established 1795', the very year Parkinson had said he was retiring! It seems far more likely that he was just moving to better premises in a more prominent trading position in the town, for the next time we hear of him (1811) he is established in the High Street. Parkinson was still listed as trading in 1823 (then aged seventy two), but by 1826 the business was already in the name of his son, Benjamin. If it was the fear of death which almost prompted him into early retirement, then it was ill-founded, for he lived to be twice the age of his father, in fact fifty years older than his father. He lived on till 1845, when he was ninety four years old. Benjamin Bothamley was born in 1799 to Parkinson Bothamley and his wife Elizabeth, who lived in the Skirbeck area of Boston. About this period the population of Boston was about 5,000, that of Skirbeck about 500. Benjamin was apprenticed in 1812 for seven years to Robert Peacock of Lincoln, who worked there till about 1815, then moved to Spalding. In 1812 Benjamin's father, Parkinson, is said to have been a farmer at Donington, about ten miles south-west of Boston, though there can be little doubt he still ran the Boston clock shop. He was then aged sixty one, so was perhaps easing his way out of clockmaking into retirement farming. It is about this time, 1810, that the unusual clock described later was made, perhaps at a time when Parkinson was split between two separate undertakings at once. Following family tradition Parkinson and his wife Elizabeth, nee Wade, christened one child with the mother's maiden name, and had a son called Wade Bothamley, who lived at Tattershall and gave birth to a further Parkinson Bothamley! Benjamin's name first seems to have headed the Boston business, now located in the Market Place, in 1826, when he would have been twenty seven years old and seven years out of his apprenticeship. He had married at Boston in 1825 to Charlotte Valentine. Benjamin, who married twice, had ten children in all, amongst them a son born in 1832, Henry William, who was later to carry on the Boston business. Benjamin's name appears in the trades directories till 1856. He died in 1860 and from 1861 Henry William, employing at the time of the 1881 census one man and one boy (i.e. an apprentice), ran the shop, which continued until at least 1929. Henry William has a son, Alfred, who was born in 1860 and also became a clockmaker. He remained a bachelor and the business closed with his death in 1929. His brother, Harry, born 1859 also became a clockmaker, initially working in Derbyshire but in later years believed to have shared the running of the Boston business. Bothamley clocks tend to be conventional longcase examples, the great majority of them signed simply 'Bothamley, Boston'. Signing by surname only tended to be typical of those in a family business, where the prestige was shared rather than claimed by one individual. One outstanding moon dial clock is known by William Bothamley, signed, as most of his clocks supposedly were, at Kirton. This is an eight-day brass dial example described, and part of the dial pictured, in 'The Arthur Negus Book of Clocks', published in 1980 by Hamlyn and written by a horologist and a friend of mine of many years standing, David Barker. Arthur Negus was a charismatic TV presenter of antiques programmes and an authority on antique furniture but in fact had very little knowledge of clocks, which is why 'his' book was written by someone else. I believe the extent of Arthur's involvement with the book was to turn up for the jacket photograph to be taken. The clock was then (1980) said to be in the museum of the Gentlemen's Society of Spalding, Lincolnshire. It is said to have been kept formerly at an old inn in Fosdyke about five miles east of Kirton and to have been consulted there by travellers and those about to cross the dangerous tidal estuary. Sir - I noticed in your last issue a paragraph in the Boston News giving a description of a notable clock, which was sold by auction in Boston on 4th inst. I have a notable clock, which, until I saw the aforementioned paragraph, I held to be unique. It now appears that two clocks were made by Mr. Bothamley of Kirton something considerably over a hundred years ago for the purpose of denoting the day of the month, the moon's age and changes, and the time of tidal water in Fosdyke Wash, to the cattle drovers and travellers crossing the Wash. The clock recently sold at Boston was designed for use at the bridge or ford over the South Forty-foot Drain at Hubberts Bridge and it was there located for many years. 2. Detail of the hood of the clock showing what appears to be a normal round dial single train 'Norfolk' timepiece. Click for closer view. The clock which I possess was designed for use at Fosdyke and shows phases of the moon by a globe painted half white and half black revolving on a vertical spindle; the moon's age and the day of the month are denoted by separate hands and dials but the really special novelty about the clock is that it shows the rising and falling of the tide in Fosdyke Wash and points out by a hand on a separate dial when if was safe and proper time for the guides and drovers with their cattle to start to cross the Wash - at that day a distance of two miles through the bare sands and shifting channels of the estuary. For many years, before tide tables and almanacs were expedient, this clock was located at the Old Inn at Fosdyke and was the daily oracle consulted by guides and travellers crossing the Wash. Mr. Rothwell, the father of the Mr. Rothwell still living at Fosdyke, took the clock as part of the inventory when he entered upon the tenancy of the Old Inn at Fosdyke in 1805 and it came into my possession in 1866. The clock is well made and shows little or no signs of wear anywhere about its works; it has a dead beat escapement and a pendulum bob weighing 26lbs and is a splendid timekeeper - Yours John Kingston'. Full sea at Fosdike br(idge? ); Reflux; Reflux; Reflux; Reflux; Reflux; Wash begins at Fosdike; Good riding; Wash begins at Cross Keys; Good riding; Good riding; Good riding; Good riding; Drover's wash; Drover's wash; Drover's wash; Drover's wash; Wash just spent at Cross Keys; Wash ends at Cross Keys; Wash just spent at Fosdike; Wash ends at Fosdike; Flux; Flux; Flux. Clearly the purpose was to indicate when it was safe to cross the estuary of the River Welland - whether on foot or riding or driving cattle, etc. Could the Cross Keys have been a local inn? The twenty four states of the crossing must have occurred during a twelve-hour cycle, as tides are at twelve-hourly intervals (approximately). Presumably this sub-dial indicator is driven below the centre from the same wheel which drives the hourly indicator above it. In other words the special dial shows two 'states' per hour. As tide times vary by differing numbers of minutes per day, which for technical reasons cannot conveniently be shown on a clock, William must have 'averaged out' the tidal times, just as all clockmakers did when showing High Water at Bristol or anywhere else. In the interests of safely he is warning most of the time about flux and reflux (we would say flowing and ebbing) of the tide, but clearly marks Good Riding over what must be about a three hour period. Both Lloyd and Barker date this clock to about 1780-1790, as we can well understand by its unusual style, but as we know that William died in 1759, it probably dates from the mid 1750s. It is altogether a most interesting clock and one of two unique Lincolnshire clocks, though of course clocks are known by other makers, which did the same thing for their own local estuaries in other parts of the country. Impressive as this clock is with its varying times of safe crossing, it was by no means rocket science. Tide tables had existed for many years for all major ports and William would have used such tables in calculating his local times for Fosdyke, probably by adding or subtracting known local time differences from the set Boston tides. Even so the clock would have been exceptionally helpful to local people as a constantly changing and instantly visible indicator of when it was safe to cross the estuary. It may well be true that it was once housed in a local inn. However this would have been a costly clock to make, probably too costly to be bought by a local innkeeper, and was more likely commissioned by some wealthy local gentleman. The clock was already half a century old in 1805, when first known to have been housed at the inn. The whereabouts of the second clock are today unknown. Recently a weight-driven wall clock came to light by Bothamley of Boston of the type sometimes called a 'Norfolk' clock - the term is used regardless of where such a clock was made. This is a development from a small tavern clock but with a japanned dial and an eight-day movement running in a short drop. Mechanically the movement is like a longcase one but such clocks are normally non-strikers, known as 'timepieces'. The dials are (dare I say) always round. This particular clock would seem to date by its style of dial and case to shortly after 1800, say 1810. The case is made of mahogany and resembles the upper half of a longcase clock. The door and the return panel of the chisel-shaped base each carry an inlaid marquetry shell. The clock case is made for a twelve-inch dial, the glass 'showing', as we say, eleven and a half inches. When we look at this clock externally it is perfectly clear what it is. But take off the hood and the surprising thing is that behind the visible circle sits a square dial. The twelve-inch square dial has painted corner patterns, which were clearly intended to be seen, yet in this case they never could be seen. On first reaction it looks as if the clock is a marriage - a square dial clock squeezed into a case designed for a round dial. Looking more closely reveals a different and quite interesting story. The dial was made with one single central winding hole, and never had other than that. It was obviously made for a timepiece - a dial for a striker has two winding holes, one for going and one for the strike. All normal domestic longcase clocks are strikers - for this purpose we can ignore Regulators and unconventional longcase timepieces, which are exceptionally unusual. So we know this dial was purpose-made by the unidentified dialmaker for a 'Norfolk' clock, though in square shape instead of the normal round. The movement is a single-train timepiece movement, also purpose-made for a 'Norfolk' clock. It was probably bought in as parts by the Bothamleys and assembled and finished by them. But the clockmaker soon found that the narrow plates of the timepiece movement did not have a wide enough span to reach the four pre-fitted dial feet of this (longcase) dial. He therefore had to add neat extension lugs to the plates to make it fit. 3. The dial when removed from the case can be seen to be a square dial, as normally made for a longcase clock, but here as a single-train timepiece. Click for closer view. The seatboard is original to the clock and the case. The dial is original to the movement and the movement to the seatboard. In other words this clock is today exactly as it was made. But it has a square dial, when it was clearly meant to have a round one. How could that be? Well, Parkinson Bothamley presumably took an order for a fine mahogany 'Norfolk' type of clock, had the case made, ordered the movement from the parts supplier and the dial from the dialmaker. A clockmaker would not order a single dial, as they had to come all the way from Birmingham, so he probably ordered this as one of a batch of several dials, in this instance a twelve-inch timepiece dial (i.e. having one central winding hole). But somebody goofed! Either Parkinson Bothamley added this to his list of other dials, arched and square, and forgot to specify a round dial, or the dialmakers carelessly overlooked the 'round' specification and made it square in error. My money is on Parkinson for having ordered it wrongly. A dialmaker was virtually never asked to make a square timepiece dial, so would be very unlikely to do so unless by specific instruction. In fact he had to adapt a normal (as yet un-drilled) four-footed twelve-inch longcase dial, whose feet ultimately proved too widely set apart to fit the slender timepiece movement such a dial was never designed for. What's more this dial was ordered by Parkinson Bothamley as a time when he was easing out of clocks into farming at Donington. His mind just was not on the job in hand, or else that job was left in the hands of some foreman managing the shop back in Boston. Either way it was a disaster. The air must have been blue. The movement was adapted to fit the dial feet. By a miracle the clock still sat correctly in the case, still 'showing' eleven and a half inches. But when the hood was removed, there were the superfluous painted corners that were otherwise permanently hidden. Presumably the clock was wanted in a hurry. No time to return the dial to Birmingham and wait several weeks for a replacement. In any case the dialmaker would not have taken back a dial he made purposely to the clockmaker's eccentric specifications and one for which he would have had no demand at all. Nobody wanted a square dial for a round dial timepiece, nobody except Parkinson Bothamley, who was stuck with it - and so he had to make it do. I wonder how he explained away to the customer the unwanted painted corners, which only ever showed when the hood was removed. Maybe he had to give a discount, something which see,s to soothe the breasts of most savage customers. But there is a sequel. This clock came up for auction recently, and was in fact bought by a descendant of the clockmaker, Parkinson Bothamley. Every clock buyer knows that there should not be painted corners hidden inside the hood of a Norfolk clock. Since everyone knew that Norfolk clock dials were round and this was square, and since extensions had been added to the movement to make it reach the dial feet, everybody at the sale assumed the clock was a marriage and refrained from bidding. The buyer, who was better informed, got an absolute bargain at a fraction of the clock's true value. Old Parkinson Bothamley must have been chuckling in his grave that the saga of the square dial timepiece worked out right in the end.